This is a terrible idea. The collection of the old masters numbers hundreds of masterworks only a fraction of which could be accommodated at the already perfectly organised and presented Bode Museum. To integrate them into that museum’s stellar holdings of European sculpture would do a disservice to both collections and inevitably lead to many works going into storage for years, and who isn’t to say that the 2018 schedule will overrun? Add to this the general risk such a move poses to the works themselves. And besides, the current Gemäldegalerie, designed by Hilmer & Sattler and Albrecht and opened in 1998, was built for its current purpose. It’s that rarest of recent art galleries — a building that actually prioritises the display of art instead of the architect’s vanity. Its rooms are well-proportioned, naturally lit and tastefully designed. And simultaneously the gallery pulls off an inspired architectural conceit by leaving empty a hall the size of a football pitch at its centre, where visitors can pause and reflect before reentering the galleries. The perfect venue for the display of one of the world’s greatest collections of European painting. Of course, it would work well for modern painting too, and the Pietzsch collection does sound awesome, not to mention entirely too large for inclusion in Mies van der Rohe’s amazing Neue Nationalgalerie next door. Furthermore, the plan to empty the Gemäldegalerie seems at least in part born of necessity — apparently the Pietzsches have donated their collection on the condition that a substantial part of it goes on immediate display. Still, the plan strikes me as a troubling concession to unreasonable demands on part of the donors, and — what’s worse — a particularly egregious manifestation of the current tendency worldwide to prioritise twentieth-century art over that of previous centuries. The reigning notion that anything before the impressionists is somehow stale and inaccessible to a broad audience betrays a sad failing of the imagination on the part of art historians and curators, not to mention a lack of historical awareness. That the indisputably important developments of twentieth-century modernism are routinely given pride of place over the combined production of all previous centuries cannot but suggest larger cultural amnesia. It’s almost as if the Berlin authorities in their effort to patch up one historically determined lacuna — the relative dearth of the art termed “degenerate” by the Nazis — are perpetuating a new one. There’s a petition going round to make the German National Galleries reconsider this ill-advised plan. Surely, some other solution — if all else fails, perhaps rotating the display of twentieth-century art at the Neue Nationalgalerie — can be arrived at. Please consider signing it and circulating to friends and colleagues who might be interested. Photo from the Gemäldegalerie by Roi Boshi. I wonder about the schism between the display of pre-20th century art and 20th century art… now, I know this is not my field, I’m a total street man on this, but I am reminded of natural processes, of equilibriums heaving back and forth as they gravitate towards a new resting point – when a new reagent has just been added. Perhaps this current trend is just one heave towards normalizing the art of _last_ century? After all, it used to be the present thing, the thing that’s happening, but now it’s not that anymore. Now it has to start it’s march towards historical art, to find its place in that domain. And it has to nudge at the stuff that’s already there, the older history. And then the older history nudges back, and then eventually a natural state is achieved… just in time for the art of this century to become non-current and then it all starts over again. Not that it means that one shouldn’t react to these heavings and waves, but that perhaps one should make up one’s mind about where the natural state is, and try to dampen the motions that go away from there… the waves may do some damage as they go too far, after all. Art is lost all the time, after all. Oh, you’re probably right in the long term, but this tendency has been going for a while now and I think it’s quite counterproductive. Also, there are issues of conservation and preservation that may have more permanent consequences if underprioritised. My, my, my. Talk about an embarrassment of riches. Most galleries would be built on a collection of painters like that. Half that. Yeah, it’s an incredible collection — I highly recommend visiting it! Matthias, as luck would have it, it seems I will be in Berlin later this year. 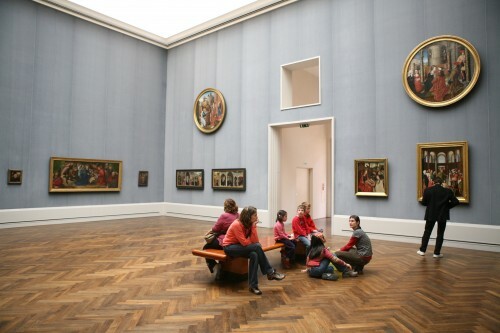 And the Gemäldegalerie is number one on my list of places to go. Do you know when this change is likely to happen? Not before October, I hope. Mike, I don’t think it’s happening just yet, though I’m unsure what the status of the plan is. But you should be ok! Enjoy! Great news: the paintings are staying. In the end, it (naturally) came down to money.